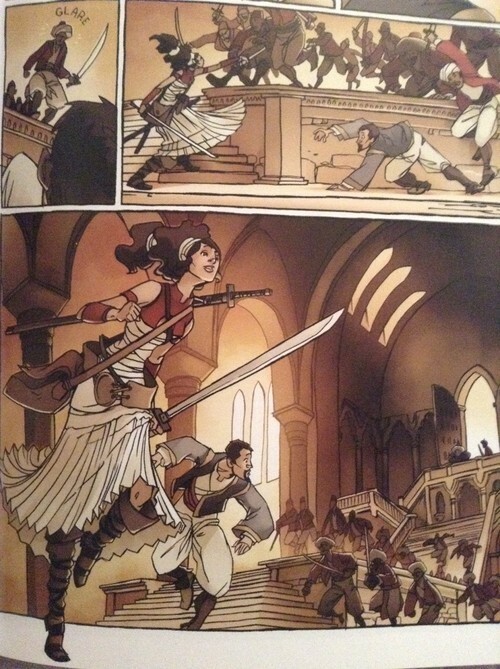 Delilah Dirk and the Turkish Lieutenant was my first foray into Tony Cliff’s body of work and the first graphic novel from First Second’s line up. 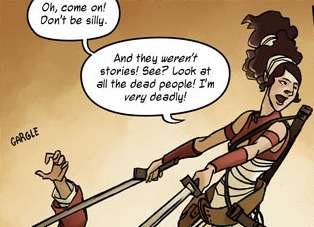 Set in the early 1800’s the titular character, Delilah Dirk is a woman after your own heart. She’s an adventurer, through and through. Delilah’s been around the world. She’s an accomplished fighter. She’s spent her childhood and most of her life growing up around different cultures, different tribes, and different people. Her fighting styles supposedly vary and she’s not afraid to use them. When our other main character, the Lieutenant, Selim, the Turkish Lieutenant meets her—she is (temporary) in a tough spot. I mean, sitting chained in a dusty jail cell, from which she escapes from quite easily, mind you. Selim. Erdemoglu Selim is the mild-mannered lieutenant in the Turkish Janissary Corps. He is reserved, quiet and a big fan of tea. After a misunderstanding in Delilah’s escape at the palace he works at, he is sentenced to death. He is seen as a traitor, as an appliance to her escape. It is not until Selim’s head is placed in position for a swift beheading that Delilah re-enters the scene in a flurry with her swords and happens to cut his ropes. Long story short as you may guessed it, they take off , Selim leaving his bearings, his work and all he’s ever known to be true. The one word I would use to describe this book is …whimsical. 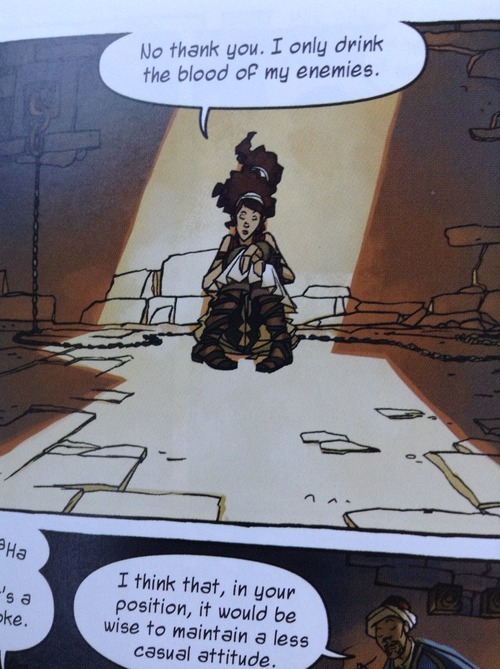 Delilah’s true mission is revealed to Selim—it’s to ultimately put a stop to the evil doings of Zakul, an pirate captain hell bent on plunder and destruction.She awes Selim with her flying boat contraction and her ability to get out of hairy situations. Selim, who was once an under-appreciated, very possibly overworked lieutenant is experiencing a life with no rules. A life of wonder. Selim is starting to feel something he never felt before: ALIVE. Truly alive. 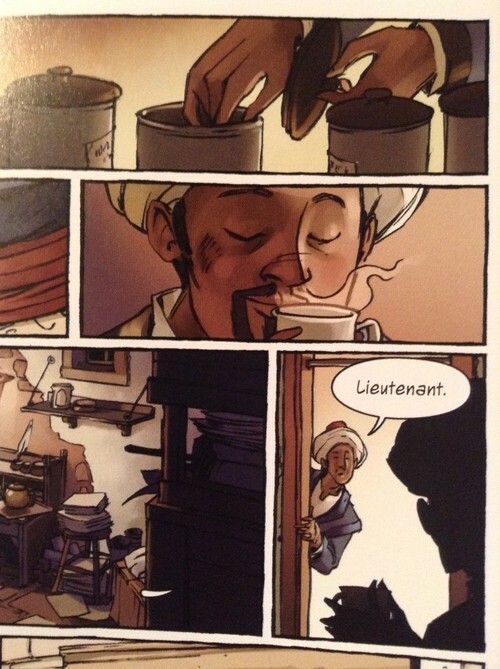 But to give Selim credit: he’s only one side of the coin, here. As awesome as Delilah is, she’s never had a traveling companion (that probably lasted and or held on to their sanity here long enough). Selim offers another point of view, more insight. And that just saves both of their hides near the close of this volume. But it’s not all fun and games, folks. While, adventure is the name of the game here, there’s also other important factors to include and think about. Selim has to consider personal responsibility and what a stable life means to him compared to a life on the run with the thrill seeking Delilah. Every choice, every action results in a resulting one. 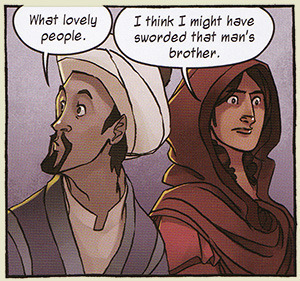 As seen in the panel below by Delilah. A few concerns from other readers that I will address her: I read an review on Goodreads of how one reader was put off by the inaccurate timeline here. Concerns that include the tea trade and when exactly did Delilah travel and meet with feathered headdressed warriors in the new world in the far west in her youth? The very first page of the book tells you that these adventures are set in the year of 1807. In my head, I did try to calculate whether logically the timeline for someof these events were in the right order and the conclusion that I came to was: it didn’t heavily subtract from my reading experience. Another concern from a reader: the improbability of Delilah’s flying boat contraction. Again, it doesn’t take away from the book too much in my reading experience. 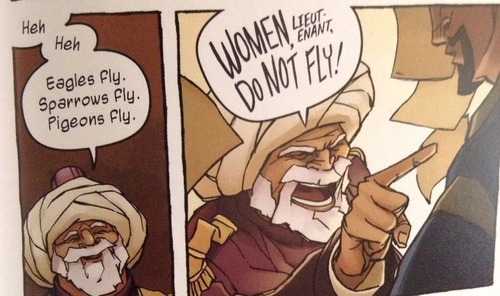 I think the flying/sailing vehicle served as an example of Delilah’s ingenious ability to create tools to better serve her globetrotting experience AND to bring a slap to in the face to those to choose to only believe and reinforce certain stereotypes and ideas about women in that day and age. The last concern that I’ll address which was one that I had while reading: While foreign, Delilah is a unmarried woman traveling throughout Constantinople (Isantbul) alone (Pre-meeting Selim) in the early 1800’s. It is a region where most people in that region are Muslim. Delilah only covers her head once in the entire book (with Selim in company) when they are eating in a restaurant like place. (Although I feel it served a dual purpose of hiding her identity too since she and Selim were still close to where they had escaped) Granted, the farther out she and Selim traveled, I figured some places would be less lax about women covering themselves, I was a bit surprised that she didn’t encounter more public inquiry about her attire. Also about her traveling with a man, who was obviously not her husband, brother or other male relative given the context of Muslim women and the time and area that they lived in. All in all, I was well entertained while reading. Captivated, even. 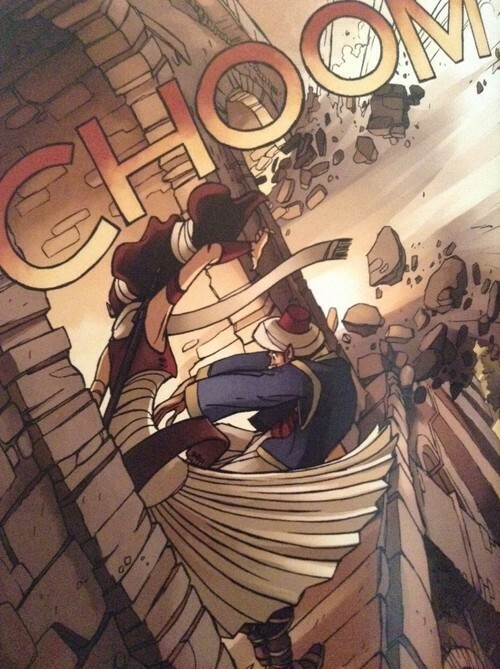 I felt that this was an excellent to reread and review Delilah Dirk and the Turkish Lieutenant’ because of the news of the sequel, “Delilah Dirk and The Blades of England’ that is in the works. If you were enchanted with this book, the next chapter of Delilah and Selim’s travels looks to be in production and coming to us in the very near future. I started with 8 because at 179 pages, I felt it to be too short. I felt a little cheated. 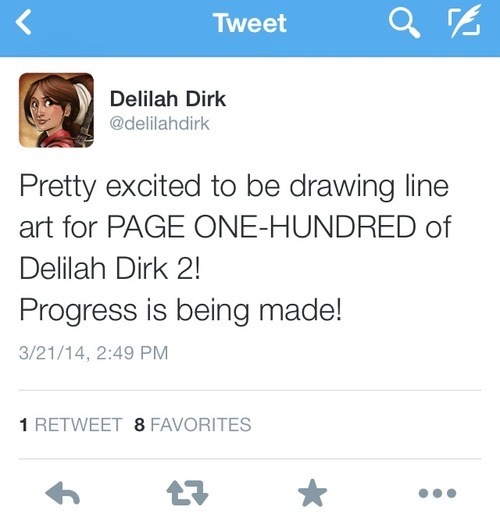 Previously unbeknownst to me Delilah Dirk got her start as a web comic; apparently her adventures were first collected on Tony Cliff’s website? So it was a long time coming. Because of that, I felt compelled to rate it higher. If you find yourself curious about this book, I implore you to read it for yourself and see if those concerns I addressed earlier on bother you enough to set the book back down. ALSO: If you venture to the website, www.deliahdirk.com , you can actually read the first half of the book FOR FREE, Y’ALL. IF you still can’t get enough, you can download the side story “Delilah Dirk and the Seeds of Good Fortune” on the same website. Take note that as for that side story, you can make an donation of your choice—-as in supporting the artist!